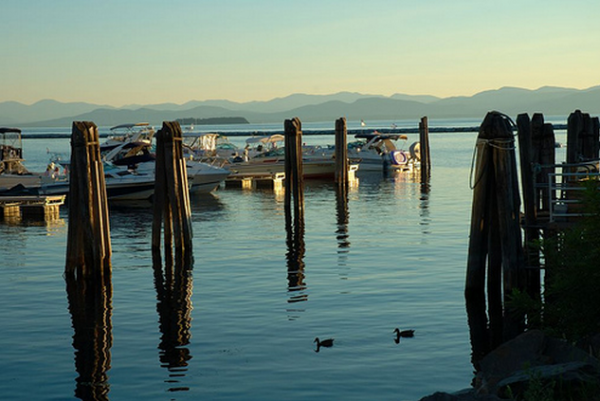 Lake Champlain is a popular tourist destination, mainly for it’s beauty and scenic views. Many visitors, however, are not aware of its equally fascinating history, including several interesting details from the past that are widely unknown. These facts may further your interest in the region, or maybe inspire a trip to the beautiful lake for the first time! Being such a vast body of water (the 6th largest in the united states), Champlain was once considered to be one of the Great Lakes. However, it was only considered part of this group for 18 days, when the bill President Clinton was rescinded. The residents of Vermont felt Champlain needed to stand on its own, as a unique body of water. One of the most unique aspects of the lake is that it connects directly to Canadian waters, as well as the Hudson river, and even the Atlantic ocean- a boat ride could take you to endless destinations. The connecting Lake George drains into one end of Champlain through a vertical drop with the same height as Niagra Falls. Lake Champlain is also home to a lot of significant history. For instance, there are rocks on the shores of the lake that experts have found to be billions of years old, as well as equally ancient fossils under the water that have contributed to scientific research. The Ticonderoga Cable Ferry, an important part of the lake’s history, has been taking people across Champlain for 250 years. A town called Ironville near to the lake is considered to be the “birthplace of the electrical age”, where electricity was first used in an industrial sense to mine iron. And during the 1900s, in the silent film era, a studio in the Lake Champlain region called “Artic City” was home to the production of many of these films. The lake itself was often featured in them. There are many things to see in the region of the lake, including the gorgeous Ausable Chasm, a natural gorge made by the Ausable river. There are many landmarks, rock sculptures, and opportunities to raft and hike around the chasm. Even in the winter, visitors can rent ice cleats and see the frozen waterfalls and icy landscapes. Another point of interest is the Champlain memorial lighthouse, which has been around since 1858 when it served as a navigational guide for many ships. It has since been remodeled and adorned with sculptures of Samuel Champlain himself and some of the scouts that travelled with him. The beauty of Lake Champlain is widely known and recognized among tourists and residents of the area. Nothing can compete with the views, and the recreational activities across the water are enough to keep any traveller busy. But with the added details and fascinating history of the region, visitors can feel that they are a part of something very significant to the country. Elements of Lake Champlain have been around for hundreds, thousands, and in some cases, millions of years, and will continue to be a part of the region’s unique nature for years to come. Samantha Howard is a wedding coordinator for the Spirit of Ethan Allen at Lake Champlain. As a wedding coordinator she guides several couples on their journey to matrimony and that sometimes includes giving them inspiration about the lake’s rich history and background. Previous : Why Isn’t Music Better Represented On TV?